**Note: This is part 4 of our series of Seven Days of Gaines. In late October 2014, over 150 abolitionists gathered at the invitation of a local Baptist church in Memphis, TN to preach the Gospel, call the city to repent of child sacrifice, and build the kingdom of God. I was privileged to be among them. We reached out to the whole University of Memphis. We called the culture to repent of hypocrisy at the Martin Luther King Jr Civil Rights Museum and Monument. We marched in solidarity with our preborn brothers and sisters from there down Beale Street. I’ve forgotten by now more things than I remember we did. I don’t know how many Gospel tracts we distributed that week. I don’t know how many people we talked to, how many times we engaged in open-air preaching. There is no telling how many babies were saved during the hours we were at the death pit, how many young souls were pricked unto repentance when we engaged students at area high schools. No telling whether the young woman whose boyfriend I rebuked and whom my friend Tim exhorted did indeed do the right thing and repent of their fornication. Whether the young Methodist college student I talked to has been living a sold-out life for the glory of God since that day. Whether the atheist whose worldview I shattered into absurdity ever examined the matter further. That’s how it is when you spread the seed of the Word of God far and wide – most of the time you don’t get to see it sprout, grow, or bear fruit. We were 150 or so. Most of us sacrificed, traveling significant distances to gather in Memphis as the body of Christ to bless the city with the Gospel of Jesus. Brother John who lives in Memphis contacted Bellevue Baptist Church (with plenty of notice ahead of time, mind you) to ask them for help in engaging the city in these outreach activities while we were there and for help in sidewalk counseling outside the Memphis abortuaries going forward. I saw a lot of things that week, some I’d never seen before. 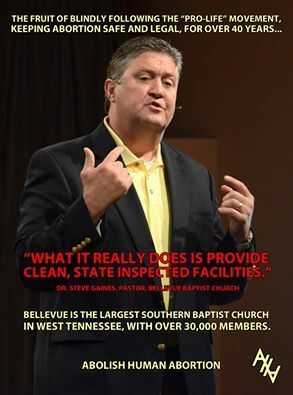 Here’s what I did not see – one single member of Bellevue Baptist Church standing with us or even doing anything similar at any of the many well-populated public places where we ministered. That’s the same thing that the brethren who live in Memphis don’t see – Bellevue Baptist involved in any tangible way in the abolition of child sacrifice, bringing the Word of God into conflict with this tremendously huge evil. On Sunday morning, November 2, 2014, we put on identical T-shirts and attended one of the morning services of Bellevue. Most of us stood when everyone else stood and sat when everyone else sat (though I sat and mourned the whole time). We were regaled with skillful rock music posing as “worship”. We were exhorted to give sacrificially so that the church building could renovate one of the entrance foyers, the posh one through which I had entered that morning. We listened as Steve Gaines told us that Tennessee Amendment 1 would be a good thing because it would “open the door for informed consent for women and girls considering abortion, inspection or regulation of abortion facilities, and hospitalization requirement for later term abortions” (source). That is to say, altars to Molech have to be close to a hospital and have wide-enough hallways and be clean. Murderous hitmen have to have a certain diploma before they are allowed to murder children. Murderous mothers have to wait a few days before they rip apart their own flesh and blood. And the pro-life movement cheers and their heroes bolster their prestige. After the “service”, we met members and engaged in great dialogue. We handed out the booklet, “Does God Hate Our Worship?” We exhorted them to read and consider our message and their responsibility seriously. We were generally told that the church was too occupied polishing the brass of their south foyer and didn’t have enough resources at that time to get involved in “politics”. Several individual members were interested in what we were saying. Then the police came and threatened to arrest us if we didn’t leave. And they did arrest one of our number for no reason. Does any one of you, when he has a case against his neighbor, dare to go to law before the unrighteous and not before the saints? Or do you not know that the saints will judge the world? On the way out we sang praise to our God who sits on the throne. Before the police arrived, however, a few brothers of mine and I approached Steve Gaines, who was flanked by no fewer than three members of his professional security personnel. Which is, you know, exactly how the Bible says the shepherd of a flock of God is supposed to act. We pled with him to engage his people to challenge the kingdom of darkness in his city with the Gospel. We asked him to lead his people to where the lost people are, where the babies are being taken to the slaughter, to worship God by practicing true religion of caring for the fatherless and establishing justice and righteousness (James 1:27, Amos 5:21-24, Isaiah 1:10-17). In essence we were pointing out that Bellevue was a big multi-million dollar complex that was already doing its own thing. That so far they hadn’t made time for all that “love your neighbor” business, that they’d been about the work of building Their Church. Gaines said with his mouth, “I agree with all that you are saying and I pray that God blesses your work and your ministry.” Then he put his hand on my shoulder and prayed to the same effect. I had no idea at the time how effective a tactic this was at shutting down all conversation while simultaneously establishing patronizing dominance over the earnest interlocutor (me). It worked. He said “Amen” and turned away, already on to the next task of administering the job of CEO of Bellevue Baptist, LLC. After we came and went, nothing has changed. Bellevue remains a polished tomb. Gaines has made even more of a name for himself. And God’s wrath grows against American churchianity. Previous story Do Greg Laurie’s Harvest Crusades Produce False Converts?